Uglyworld #431 - Babo Goes Easter Egg Hunting, originally uploaded by www.bazpics.com. With Easter Sunday already having got off to a great start with the success of the "cheer up Choco" campaign, and then the fun of the Ugly Conga which followed, most of the group were lying sound asleep on the couch. 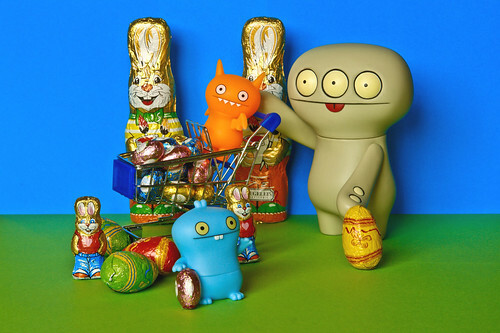 Babo had been thinking all morning that there was something else special which was to happen today, and eventually he remembered that today was also Easter Sunday. He woke up Cinko and Ice-Bat and told them of a great plan he had while everyone else was sleeping, "We musts be very quiets not to wakes everyone elses up, Cinko you gets the shoppings trolley, Ice-Bat you can flys high overs the garden and tells me where you can sees eggs, and I picks them up and puts thems into the trolley of Cinko, everyone knows their jobs?". With a nod Cinko grabbed the shopping trolley, and a quick wink signalled Ice-Bat was ready and waited for his aerial mission. As you can see their plan seems to have gone great, and they're now all back inside with a massive haul of easter eggs waiting to share with the rest of the guys once they wake up from their afternoon nap.